North Carolina winning the Prosperity Cup again this year will come as a shock to some. It tied with Texas for the win in 2016 and placed first in 2015, when the ranking was still known as the Top Competitive States. The state’s strong showing in this measure of state economic development agency effectiveness is not new (see the methodology on page 102). But it may confound those who had written off the Tar Heel State as a business-climate backwater after its House Bill 2 — the “bathroom bill” — sat on the books from March 2016 until a compromise bill cleared the air in late March 2017. HB2 prevented municipalities from enacting ordinances that exceeded or varied from state-mandated restrictions on restroom use by transgender individuals and was therefore deemed discriminatory. National sporting events booked at North Carolina venues bailed, some companies pulled the plug on expansions or relocations, and the lights went out in the state as a destination for capital investment. Well, the last part didn’t actually happen — not by a long shot. 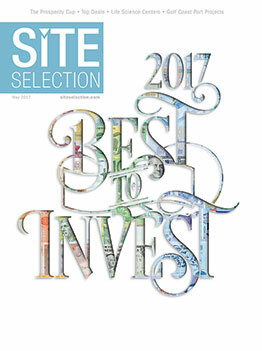 In fact, North Carolina ranked fourth nationally in total new and expanded facility announcements for 2016 in Site Selection’s March 2017 Governor’s Cup ranking, with 289 projects. It ranked seventh nationally in the per capita Governor’s Cup tally of projects for the year — these performances are unchanged from the previous year. HB2 didn’t change the strategic significance of a North Carolina location to companies already there, nor to most considering it a potential addition to their real estate portfolios. It still has one of the most educated workforces in the US; a temperate climate; two international airports, including a major hub for American Airlines at Charlotte, which is also a top financial center; three coastal ports; a desirable mid-Atlantic location; top research universities and community colleges and a 3 percent corporate income tax rate — the lowest such rate east of the Mississippi other than Ohio, which imposes a gross receipts tax in lieu of corporate income tax. Copeland says other fixes are in the works, as well. On April 18th, Trilliant Networks announced it will establish its global headquarters in the Research Triangle Area, creating 130 jobs over the next five years. The smart grid software and communications company will invest $1.8 million at its current offices in Cary to accommodate this expansion of corporate operations. Trilliant offers the energy industry’s only enterprise-wide Smart Communications Platform for connecting the internet of things (IoT) through a secure, standards-based, multi-technology, open-spectrum solution. Trilliant will hire several positions to support world-wide operations of the company. Salaries will vary by position, with a total annual payroll impact of more than $13 million. Wake County’s overall average wage is currently $53,783 per year. N.C. Commerce and the Economic Development Partnership of North Carolina led the state’s support for the company’s expansion, which will be facilitated, in part, by a Job Development Investment Grant (JDIG) approved by the state’s Economic Investment Committee. Has too much been made of the HB2 controversy in North Carolina? Or not enough? It depends on who is asked. But like it or not, area competitiveness is at stake when such matters are legislated. “We do a lot of work with Bay Area companies, and we had at least two clients last year that I can think of, and I bet there are more, that ruled out North Carolina because of that law,” says Matt Ryder, managing principal at Cresa Consulting Group in Atlanta. “Both said they would not explain to their employees why they chose to go to North Carolina. That is certainly something that is influencing North Carolina’s competitiveness. Another is the evolution of JDIG and whether North Carolina will be as competitive in projects where incentives matter.” JDIG resources have been increasingly difficult to come by in North Carolina’s urban centers, says Ryder, as more attention is focused of late on developing rural areas. His perception of a new push in rural economic development in the state is on the mark. In April, Secretary Copeland appointed Napoleon Wallace, a finance and community development executive, as the department’s Assistant Secretary for Rural Economic Development. He will spearhead the department’s support for North Carolina’s rural communities, leading a team of specialists that help communities make the necessary preparations and infrastructure investments to attract business and economic growth. “We have been successful in many rural areas, bringing in some of the advanced manufacturing and non-woven textiles,” says Copeland. “In particular, we have an Israeli sector of nonwovens — about 17 of them now — and every one of them is in a rural county, and they are expanding. One of them that came over about 10 years ago with a minimal investment did a $180-million investment two years ago. It’s in a rural county. We are having success there. Copeland says his team will work in rural communities and metropolitan areas to innovate in workforce development. “We’re big advocates of expanding apprenticeship programs, working through community colleges and companies,” he relates. “Bosch and GE are among the companies that have apprenticeship programs, and we want to expand those. We are seeking continued funding of customized training through our community colleges for companies — that’s in rural and urban areas. It’s really important in areas that don’t have the other attractions the urban areas have.